Note: Due to refurbishments, the Captain’s Grille Lunch period will be relocated to the oceanic-themed Ariel’s from late-May to fall 2017. We don't know what the internal refurbishments at Captain’s Grille include, so it's a little difficult to describe the current environment. We've seen these thing go both ways. Sometimes many things change, other times… it's hard to tell anything was refurbished! We'll update our description as soon as we know more! Another interesting aspect about the refurbishment is the Lunch menu itself. 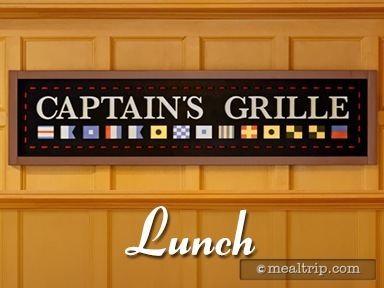 Captain’s Grille has been one of those few locations that offered a slightly different lunch menu than dinner. There seems to be a recent trend company-wide to collapse the lunch and dinner menu into one single "post breakfast" menu. Only time will tell if that's the way Captain’s Grille is going to go.